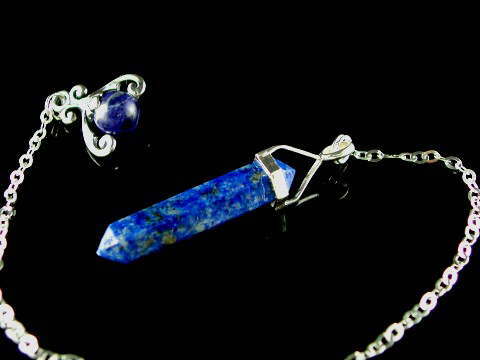 Superb colour, A-Grade, Lapis Lazuli wand-style point, set in a 'collar and loop' and finished with a trace chain and ornate, filigree 'topper' with Lapis Lazuli bead, all in 925 sterling silver. Lapis Lazuli is one of the best intuitive or psychic stones, working by activating and stimulating spiritual energy. This makes it an excellent choice for a pendulum. It opens the Third Eye or Brow chakra and when meditated with it can facilitate spiritual journeying. The metallic inclusions in this exquisite stone are Pyrite, make it a protective crystal which shields the user or wearer from negative, low vibration energies; reflecting them back to their source. Lapis is considered one of the most important 'Master' crystals and it was often used by the ancients in ceremonial breastplates of High Priests and Priestess', not only in Egypt, but across Europe. It is also said to increases bonds in friendship and love, making it an ideal gift for a friend or token of affection for a loved one.